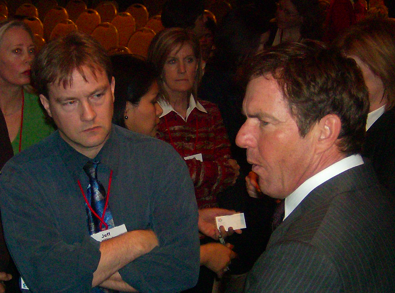 I’m at the opening session of Health Journalism 2008, which is being kicked off by Dennis Quaid telling the story about his twins daughters receiving 1,000 times the recommended dose of Heparin. Quaid and his wife have started a foundation to help combat medical errors. One of the measures they advocate is bedside bar-coding. The breach of patient privacy in their case was another concern. The overdose incident happened (twice) on a Sunday, and was discovered late Monday night. When the Quaids came to the hospital early Monday they were met by risk management, and during the process of the Heparin working its way out of the system (a 41-hour process), he said blood was squirting on the walls. On Tuesday they got a call that the news was all over the gossip site TMZ, even though the Quaids hadn’t told even their close family members. A few months before this incident, three children in Indianapolis died of an overdose when adult Heparin was given in place of the pediatric dose. The Quaids are suing Baxter, not Cedars Sinai, though, because the product wasn’t recalled when the Indianapolis incident happened. He said he’s not interested in any settlement that involves non-disclosure; he wants to raise awareness about the problem of patient safety. I will have some video highlights from Quaid’s presentation a bit later. It’s good that he is giving public attention to this issue. As he says, patient safety doesn’t typically make headlines because incidents happen one at a time, and not to celebrities. He is making a lot of the same points I’ve heard patient safety leaders make at Mayo Clinic. He has a megaphone that enables him to get the issue noticed, and today he spoke to a bunch of journalists who I’m sure will help with the effort. I wonder whether bloggers will take up this patient safety issue in a big way.